Hardwood floors are beautiful and can really upgrade a kitchen from drab to fab, but be warned, they come with a bit of work to maintain the beauty. 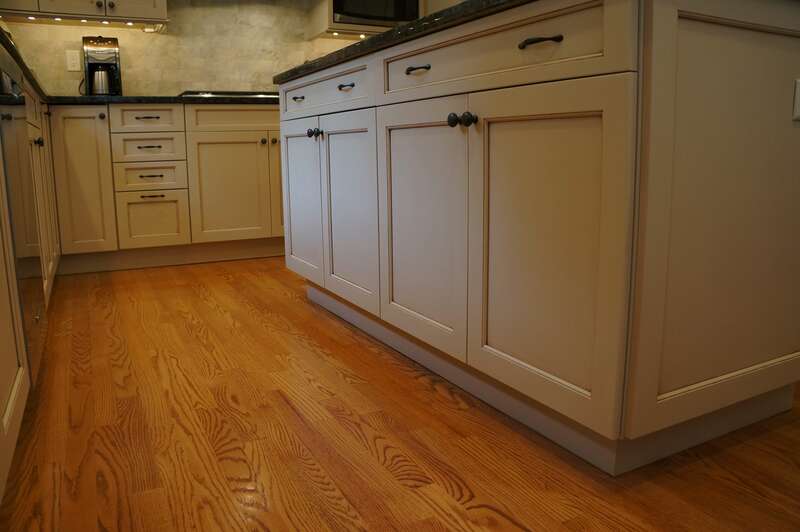 Don’t be mistaken though, with the right level of care, the hardwood floors in your kitchen can last a lifetime. Before you jump in headfirst, you should do your research. Some types of wood require more upkeep than others, making hardwood flooring an option that may not be right for everyone. If you’re in the market for new kitchen flooring, you may be considering hardwood. Though this is a beautiful option, it may not be right for you. Taking a look at the pros and cons of hardwood flooring can help determine if you should go for it, or steer clear. Tile floors are much colder and harder than wood, though a rug could easily solve these issues. Hardwood flooring is a much warmer and softer option for your feet compared to a tile floor. Hardwood floors are stunning. It’s a simple fact. With the variety of wood types and grain patterns, it’s easy to achieve a look unique to your home. If you are opting for a specific look, it is important to keep in mind that different woods stain differently. Make sure to test out different pieces to make sure you can achieve your desired look. Hardwood flooring is very versatile and works well in both modern and contemporary style homes. Hardwood flooring can last a lifetime, though that doesn’t make it immune to wear and tear. Water damage is one of the worst things that can happen to a hardwood floor and can result in the need for a replacement. Standing water or an unresolved leak will cause permanent damage, though a water spill or puddle that is cleaned up immediately will not cause any problems. Unfortunately, as beautiful as hardwood flooring can be, there are cons to having it in your kitchen. A hardwood floor is a bit of an investment compared to other options as the starting price for uninstalled wood planks is on the expensive side ($4-$12 per square foot) and it comes with a hefty price tag for the installation considering the extensive process of sanding and finishing. Though a hardwood floor is softer than tile, it is not the softest option out there. Vinyl, cork and linoleum are all softer options than a hardwood floor, so if you are looking for a softer floor, you may want to consider other options. Though a hardwood floor can last as long as a lifetime, that span doesn’t come without a commitment to long-term maintenance. Ideally, a hardwood floor should be sanded and refinished about every 10 years. This may not seem like a big deal, but this process can take upwards of several days and is not cheap. When it comes down to it, the decision should be made based on a few factors. Do you want a hardwood floor in your kitchen? If yes, can you commit to the money and maintenance it requires to make it worth it in the long run? Answer these questions and you should be able to decide whether or not hardwood flooring in your kitchen is the right call. If you decide you do want hardwood floors in your kitchen and you’re unsure of which wood will withstand the best in your kitchen, consult with Magnificent Kitchens! We are happy to go through the options with you and decide which is best for you. To get started or to meet with one of our designers you can call us at 508-875-4004 or contact us on our website.